Intel’s latest chip could be mistaken as an AMD-killer, a truly next-gen processor that would really stick it to the red team’s efforts. But it’s not. 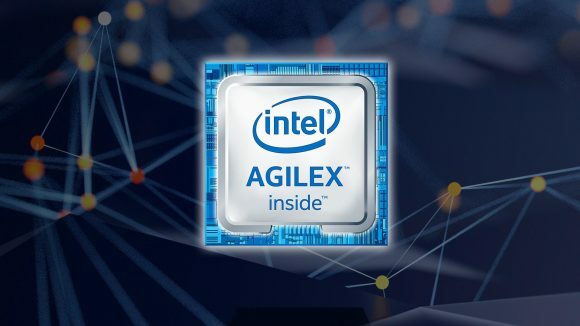 While its specs lists is potentially mighty, combining the 10nm process with PCIe 5.0 and DDR5 support, Intel Agilex is instead solely for the data-obsessed amongst us. But that doesn’t mean that Intel’s latest big data push isn’t noteworthy in itself. Intel has been vying for prime position in the FPGA market ever since it purchased programmable logic company Altera for $16.7bn. Yes, you read that right. That’s a whole lotta’ cash, and its got a lot of competition in the market from Xilinx and other companies you’ve probably never heard of. But there’s evidently a lot of money to be made in programmable chips. To get an edge on its competition, Intel has announced the Intel Agilex FPGA on the 10nm process, offering up to 40% higher performance or 40% power-savings compared to its previous Stratix generation. The chip also utilises Intel EMIB technology – that’s the same chiplet bridging interconnect that was utilised on the Intel/AMD crossover Kaby Lake G chips. This allows it to offer a mix-and-match approach of tiles and chips to suit a client’s needs. 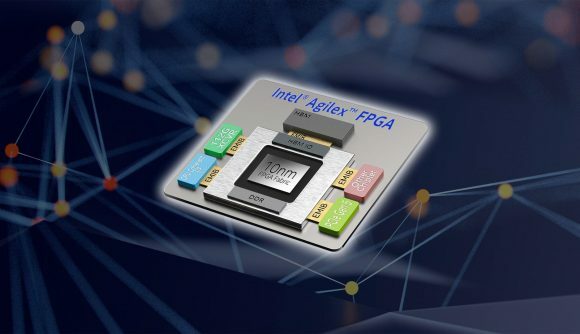 Through the use of its interconnect and chiplets, Intel Agilex will support DDR5, high-bandwidth memory (HBM), and Intel Optane DC across three series: F, I, and M. These FGPAs have a wide brief, thanks to their programmable nature, lending to applications in networking, the cloud, and even AI acceleration, partially thanks to the bfloat16 number format. AnandTech reports that Intel is hoping to offer 3D stacking with future generations of Agilex, perhaps building upon its recently announced Intel Foveros technology. Intel’s 10nm process has a hot topic amongst gamers, enthusiasts, and even financial analysts for the last few years. The company hasn’t had much luck with its advanced process node development, only managing a pitiful dual-core ultra-low power chip with the process so far. But Intel is reaching crunch time. That’s when AMD, utilising the might of TSMC’s 7nm process node, will gain process node advantage and take the fight to Chipzilla with AMD Ryzen 3000 and EPYC Rome. Similarly, the Zen 2 architecture at the centre of both products will utilise a scalable, cost-effective chiplet approach. To fend AMD off as best it can, Intel is touting its 10nm process for a holiday 2019 launch. Desktop chips could wait around until sometime in 2020, however, as Intel Comet Lake is set to cater towards gamers’ needs in the meantime. Intel’s first defence against the red team’s dark arts comes in the form of new server chips: Cascade Lake, or 2nd Gen Xeon Scalable. Joining Skylake on the LGA 3647 socket, these are available with up to 56 cores, Optane support, higher frequencies, increased cache, AI deep learning optimisations, increased memory support, and in-silicon mitigations for little ol’ Spectre.